This is Concepts in Wood executive desk, which is constructed of hand select American Red Oak solids and veneers over engineered wood and has a polyurethane finish that resists stains. It features two file drawers on full extension ball bearing drawer glides. File drawers accommodate letter and legal size files. The desk also features four box drawers and a large center drawer. Concepts in Wood has been a family business serving Seattle since 1980 that specializes in wood furniture, including custom building, custom finishing, and delivery. Custom building and finishing services are also available, as well as complete delivery services. Concepts in Wood offers a wide variety of entertainment centers. They have many sizes available from a small T.V./VCR stand to a massive wall unit. They also carry entertainment armoires. Custom building is available to meet your specifications. 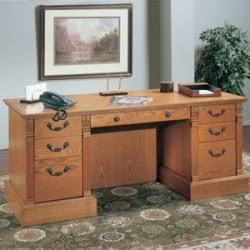 Concepts in Wood has many options for home office. They offer computer furniture to fill any need in Oak, Pine, or Alder. Also they can furnish a complete room or just a small section with style and convenience. Your office needs to be functional but at the same time you want it to be stylish too. Sauder office furniture is always chosen for the best comfort, classic style, and long-term durability they give to users.